A view of the golf course can be as exhilarating as a view of the ocean. 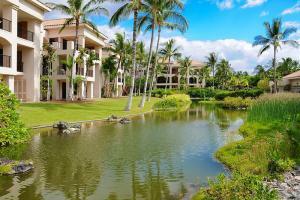 Located on the sun-drenched Kohala Coast between the Kings Course and Beach Course in the Waikoloa Resort, this resort's suites feature large private lanai with wet bar, perfect for entertainment and enjoying the views. Guests have access to the nearby shops, restaurants and activities. Swimming, snorkeling and body boarding are all just a short walk to Anaehoomalu Beach. On the south Kohala Coast at the Waikoloa Beach Resort. Approximately 17 miles from Keahole Airport.